NEW DELHI: Congress president Rahul Gandhi on Thursday launched another round of scathing attack on prime minister Narendra Modi, calling him a ‘darpok’ and ‘kayar’ (both meaning coward). 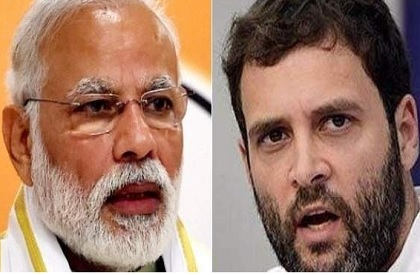 Rahul said that Modi would run away if asked to debate with him (Gandhi) for five minutes on the stage on issues of national security and Rafale deal. The Congress president was in a visibly aggressive mode as he addressed the national convention of minorities’ cells of the Congress. As Gandhi dared the PM for a debate and launched his ‘darpok’ barb, the audience roared a huge applause and the leaders on the stage also gave a standing ovation to the party president. He also told the audience that they were ‘sher ke bachche’ (tiger progeny) and added that they could easily make Modi run away. Rahul also attacked the BJP and RSS and said that the RSS had its members in every constitutional body of the country and want to run India ‘from Nagpur’. “But we would not let this happen. Let RSS, BJP, Modi and Shah all four come, we would show them the reality in three months (referring to Lok Sabha polls).